4 Myths about the U.S. Civil War. Plus a Bonus Fact! The truth? 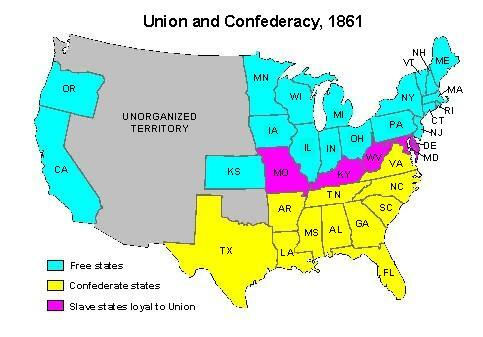 The North attacked the South in order to stop the secession. That’s all. The reason didn’t matter … the bottom line was, “No, you can’t go.” The South could have tried to secede for ANY reason, and the end result would have been the same. Why? For one, the South, if treated as an independent country, was very wealthy. In fact, it had the fourth largest economy in the world at that time, and it accounted for more than 60% of America’s exports. 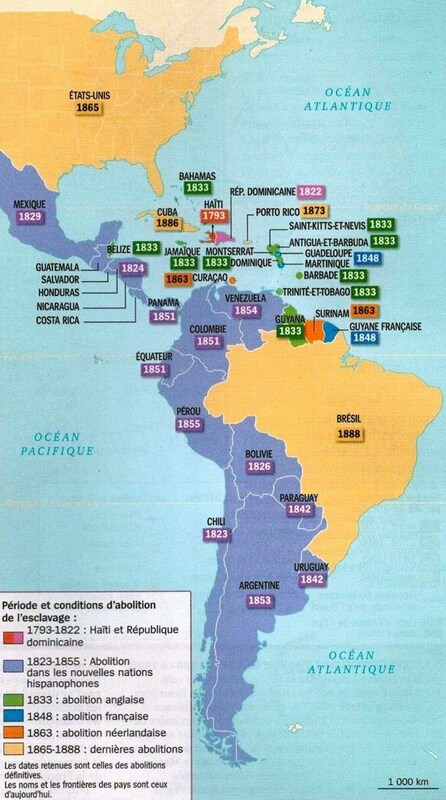 Many people don’t realize that slavery was present in almost every North/Central/South American country, from Canada to Chile. European countries like England, France, Portugal, Spain and even Italy dabbled in slavery and slave trade. And how many civil wars happened in those countries to end slavery? NONE! Yeah, it’s such nonsense that a costly, destructive war was needed to end slavery. Here is a map that shows how most countries peacefully ended slavery – most before 1865 and some, like Brazil, about 20 years after the U.S.
Well, talk to the ghosts of the tens of millions of Native Americans who were slaughtered by the kind Northerners. As for blacks, yeah, certainly the North gets some credit for passing laws that theoretically gave some rights to blacks. In practice, blacks were segregated, were allowed to do only menial jobs, didn’t vote etc. Let’s just say that Lincoln wouldn’t have been too happy if his daughter brought a black dude over for dinner. BTW, fast forward to 2015, and there are millions of African Americans who are thrown in prisons and made to work for big corporations like Walmart and Starbucks. Watch this quick video on this modern-day slavery. Seriously, it wasn’t even a Civil War. A civil war is one where two fractions fight to take control over the same country. In this case, the South didn’t want to rule the North; the South just wanted to go its own way. If a guy beat up his girlfriend when she tried to leave him, that’s not a domestic dispute. It’s ironic how when America was founded, and it wanted to leave England, that was an awesome thing — you know, wonderful concepts such as “self determination”, “freedom”. “liberty” etc. So, don’t believe everything you learn in school or from the corrupt mainstream media! A bit of apologia here. The North did not “Attack” the South. Fort Sumter was attacked as were every federal institution forcibly taken by the South. Yes Slavery existed in a lot of places ( why not mention Rome and Greece while you are at it) But it was largely gone 30 years before the Civil War and earlier. Historically there have been numerous civil wars which were wars of partition (Sri Lanka, Bangladesh, Biafra are recent examples.) Look at the congressional records and see the myriad of debates were slavery is THE central distinguishing feature of disagreement. Look to the commentary of southern leadership at the time where they hang themselves over slavery with there own words. Find one who supported abolition. Would slavery have ended eventually. Maybe. Or maybe the Civil war was inevitable on this issue. Two things are for certain. It did happen and slavery was a significant and central causal factor. Not the only one, but the war would never have happened without the slavery issue. I came across this website while searching something on the web. I would say that this is really I great post. Please keep sharing such posts. How did the South become the 4th largest economy in the world at that time? How did the South account for 60% of America’s exports? What were they exporting? That’s right genisus, cotton, tobacco, and every other product gained off the work of toil of their slaves (for which they would die to keep). But it was not about that, huh? Of course. The south wanted slavery, for sure. Like the north wanted slavery when they were not so industrialized. Or like all other countries that had slavery. More revisionist history being pumped into the soft brains of our youth by marxists. This is another fine example of the humanity of White Peoples being removed from the narrative – I mean after all the Civil War COULDN’T have been about ending slavery because IMPERIALISM, COLONIALISM, WHITE SUPREMACY!!! Beware the globalists, they are up to no good.